When you think of the beach, what do you envision? Do you think of the white sand beaches of the Caribbean? Do you picture the pink sand beaches in Bermuda? What about black or red sand beaches in the Hawaiian islands? Did you even think green sand beaches existed? It does, in the Big Island of Hawaii. The Pacific coast beaches are gold or even golden brown. Regardless of the color of the sand, what could be more relaxing than a beachfront resort with beautiful palm trees swaying in the breeze? Can you picture yourself on a lounge chair with a drink in your hand? Or how does zip lining through the tree tops or taking an ATV tour or kayaking, snorkeling or scuba diving in crystal blue waters sound to you? Whatever you want to do or don’t want to do, there is likely an tropical beach destination that will fit the bill. The most popular beach destinations are in the Caribbean where you will find some of the most fabulous beaches in the world. Seven Mile Beach in Grand Cayman or Jamaica, Palm Beach in Aruba, the Crane Beach in Barbados, Horseshoe Bay in Bermuda (although not technically the Caribbean) and Bavaro Beach in Punta Cana are renowned for their powdery sand and turquoise waters. The Caribbean is typically known for its calm seas but where the Atlantic meets the Caribbean (like on the north side of Barbados) you can find some good surfing, too. Mexico, has some wonderful beach destinations as well. 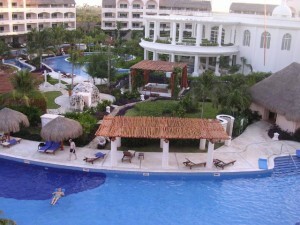 The Riviera Maya, Cancun, Cabo San Lucas, Puerto Vallarta and Acapulco are some of the better known beach destinations. 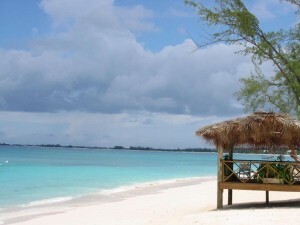 One of the most popular ways to get great value for your island getaway is to go “all inclusive”. Back in 1950, a Belgium water polo champion opened the first Club Med in Mallorca, Spain and launched the beginning of all inclusive resorts. Although the first accommodations were unlit straw huts on the beach with communal facilities, all inclusive resorts have come a long way in the 50 years since they were introduced. Resorts now range from 5 star deluxe properties with gorgeous suites, marble baths, in room Jacuzzis, multiple choices in dining and more or they can be basic properties with standard rooms offering dining in a limited number of restaurants. All-inclusive resorts are becoming increasingly popular with vacationers worldwide. Your upfront cost is set and your out of pocket expenses are limited which makes this a great option for vacationers. Some of the all inclusive resorts might include discounts on spa treatments and golf. Others may include more in terms of water sports and day time activities. Some resorts may include only domestic liquor with an additional charge for certain wines and premium liquor and some may have limits on dining in certain restaurants. My Vacation Lady can certainly help you figure out which resort offers what you are looking for in your vacation. In order to recommend the best property for you, we ask our clients a number of questions. Are you looking for an adult only property? Are you looking for a moderate property or more deluxe property? Do you want a beach front or ocean view room or are you ok with the room being a short walk to the beach? Do you prefer to have a sit down (a la carte) dinner or do you prefer to eat buffet style? How far from the airport do you want to be? Are you more of a beach person or a pool person? How important is a casino, or a spa, or golf? Would you prefer a large property with lots of pools and lots to do during the day or do you prefer a smaller, more intimate property? What kind of atmosphere do you want- active, quiet, fun, romantic? With the answers to questions like these and many more, we can help recommend resorts that might work for you and help your dream vacation become reality. Are you confused yet? It can be confusing on which resort will make your island and beach vacation one that you will remember for many years, so call My Vacation Lady and we can help recommend the best options for you! Take the stress out of your tropical beach vacation planning. Let My Vacation Lady help plan a memorable trip for you. Call now (732) 418-0819 or or send us an email.